Arsène Lupin is not the sort of chap one would like one’s daughter to bring home for tea. In fact, if she did, it would probably be a good idea to count the teaspoons after he had left, because Lupin is a burglar, pickpocket, blackmailer and an escaped convict, amongst his other distinctions. Still, in many ways, he is a force for good. He draws the line at murder, is not averse to helping his great adversary, Inspecteur Ganimard , to solve a tricky case and his victims tend to be rather unpleasant creatures. 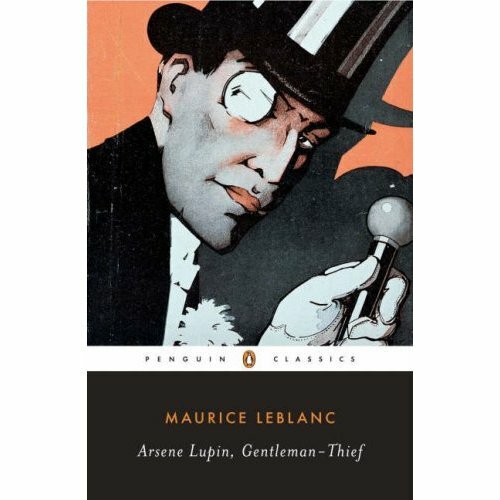 In fact, Lupin is part of a small literary tradition of gentlemen thieves and adventurers who stroll through life operating firmly on the wrong side of the law, whilst following a personal code of honour. Amongst his spiritual companions are his near contemporary A.J. Raffles, the cricketing gentleman thief of Victorian London, and Simon Templar, also known as the Saint. There is even a slight whiff of Lord Peter Wimsey about him, in terms of his personal style and panache, although the two tread very different paths. I have a personal fondness for late Victorian and Edwardian mysteries and detective fiction. As well as Lupin and Raffles, I am a Sherlock Holmes enthusiast and am also perfectly happy to dip into a Sexton Blake story, a Father Brown tale or one of Sax Rohmer’s Fu Manchu novels. It has to be admitted that, in general, many of these types of book contain shallow characterisation, are stylistically clumsy and rely upon frankly implausible plot devices. But who cares? They are rattling good yarns that demand no real concentration and are perfect with a mug of tea and a plate of buttered toast on a cold winter afternoon. Lupin was created by Maurice Leblanc in 1905 and has since gone on to star in twenty five novels and volumes of short stories as well as films, TV programmes and stage productions. It is fair to say that his popularity in the Francophone world is similar to that of Sherlock Holmes in the English speaking world. Lupin and Holmes even cross swords in the 1906 short story, “Sherlock Holmes arrives too late”, in which the two men acknowledge each other as equals. Following a complaint from Sir Arthur Conan Doyle, Lupin later meets one Herlock Sholmes (see what he did there?) in several stories. The Arsène Lupin stories are not for everyone. As I have commented on earlier, their pleasure lies in their pace and in the storyline. They are not masterpieces of literary style and so will not appeal to everyone. If you like vintage detective stories, however, and have not come across M. Lupin, give him a go. Next, it’s back to both the 1,001 Book project and the Banned Books challenge, with “Brave New World” and “1984”. Anyway, my first introduction to Lupin was this Japanese animation, and everything had been placed in the contemporary setting. I was a child then, and it'll be interesting to see Lupin in his original element, since I've grown up a bit. I recently read the first Sherlock Holmes novel, and was surprised, really, that I loved it so much. So I know I'm going to give this one a try [I've already sen this edition in bookstores!]. Thanks! Interesting post. I was unfamiliar with LeBlanc and, naturally, the Lupin character. At first I thought, "didn't he steal that name from Poe's detective in The Purloined Letter?" but once my foggy memory cleared I realize that is Auguste "Dupin"
I may have to seek out one ofnthese stories & give it a try. Sasha - It's my pleasure. This edition is a selection of the short stories and suffers a bit from lack of continuity but i guess it is a good starting place. Jay - I was really surprised when I found out how popular Lupin is. As Sasha says, he has even made it into Japanese manga. Have you by any chance read A League of Extraordinary Gentlemen? I believe Lupin is in there somewhere. If you like late Victorian and Edwardian (mysteries or any other genre) this is the comic novel for you, full of more or less obscure literary references. I am tempted to try my luck with this Lupin chap (was especially hooked by the Wimsey reference). Thanks for the recommendation. Alexandra - I have indeed read the League of Extraordinary Gentlemen. I think Lupin turns up in one of the sequels to it. Interestingly, Alan Moore apparently said that he hadn't included Sherlock Holmes in the League as he would overhelm all the other characters!